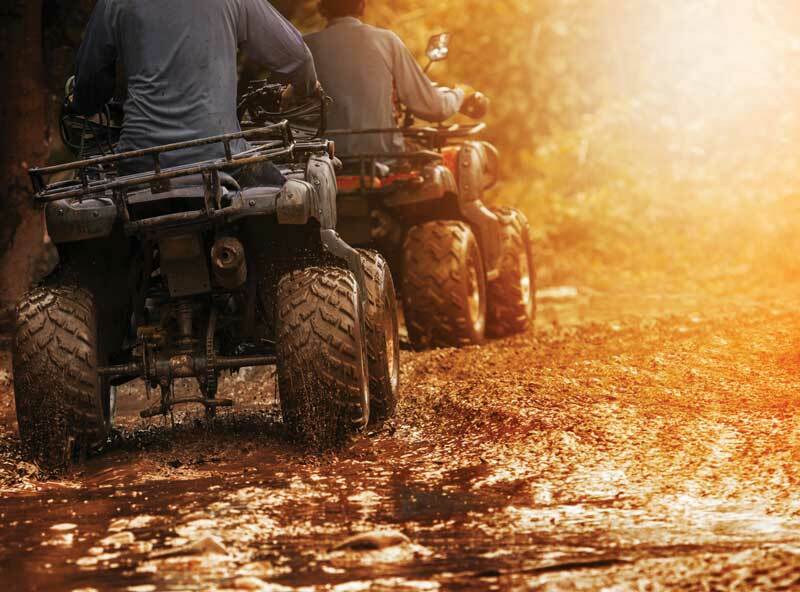 Many people enjoy getting off the beaten path in their spare time with a drive on an ATV (all-terrain vehicle) or OHV (off-highway vehicle). Hey, it’s fun to get out there and get dirty zipping around on a 4-wheeler! It’s also nice to take that long, leisurely ride through the woods, enjoying the view while navigating a course with some challenge to it. Here in Florida we have some spectacular trails available on public lands. Most of the trails on public lands are made specifically for low-speed travel. The idea is to enjoy the journey and the scenery. This is not the place for tearing through straightaways and churning up mud. Keep that in mind as you head out into areas that will offer gorgeous views and glimpses of nature in exchange for speed and rowdiness. The trails have been laid out in such a way as to have as little impact as possible on the surrounding habitat, so be sure to stick to the trails. Some parks do require permits to operate ATVs or OHVs on the property, so do your homework ahead of time. All of the following areas have online resources available to help you plan your outing. Use these resources to ensure trails are open after heavy rains, or to check fees. Know before you go, so you don’t end up disappointed. If you are looking for a fun ride through the woods with lots of twists and turns, you’ll definitely want to check out Blackwater River State Forest for a run. Riders under the age of 15 need to take a safety course before they can head out on this one. It costs $15 per rider, and the trails are mostly amateur level, with some novice, and a few expert trails. Overall, there are 53 miles of trails out here. It’s mostly loose dirt and some hard pack, surrounded by many trees. This is a very popular area with over 100 miles of motorized trails. Silver Lake is the only trailhead that has ATV access, though there are other staging areas. It’s $10 per rider but you also need a trail pass which is $75 for three days. There are plenty of areas to stop and have a picnic or play around, and Silver Lake even has BBQ grills and a beach (there is a fee to use this facility though). Some trails are prone to flooding after severe weather, so call ahead to make sure everything is open. This area is mostly novice trails, with some amateur level trails, and a few expert ones. This sandy trail system is a dream come true for motorbike riders. There are play pits with steep drop-offs and mud bogs, and even a peewee track for beginner riders to hone their skills on. A single day riding permit is $15, the annual pass fee is $80 for July 1 through December 30. Camping is available at the site, so you may consider making a multi-day adventure of your trip. This area contains mostly amateur trails, with some for novices, and a few for experts. The Mallory Swamp ATV Trail is located within the Suwannee River Water Management District, and is open from late April to late September. There is no fee for riding, or for the requisite trail pass. It’s mostly hard pack and roads, so is great for a group of beginners. Most of the trails are for novices, with some for amateurs, and a few for experts. No fees and an easy ride. The Ocala Forest offers a host of fun, sandy trails to ride on, including the Longleaf Trail, which is open to vehicles up to 65 inches wide, and the Motorcycle Loop Trailhead, for those looking for just a simple, single track. The staging areas are good and there is a nice campground on site for those looking to make the most of their time outdoors. There are plenty of berms to keep things interesting, and lots of trees. The paths are mostly amateur level, with some novice, and a few expert. The riding fee is $10 per rider. The three-day pass is $10, $5 for kids 15 and under. Additional fees for camping and parking. If you’re looking to really get down and dirty, check out the Osceola National Forest. This area is prone to soggy conditions, so if you want a challenge that can be explored by ATV or Jeep, this is a good way to go. Despite the mud and water crossings, it is mostly novice trails, with some amateur level, and none that are expert level. There is no fee to ride, nor is a permit required. All you need is your sense of adventure and you’re good to go! We hope this helps you plan your next off-roading escapade. Make sure that your vehicle is properly registered and insured, and always wear a helmet (especially kids – it’s the law if you’re under 16). Now get out there and explore!